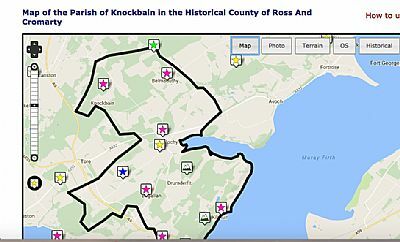 In 2014 people met to explore the heritage of Knockbain Parish on the Black Isle through courses, fieldtrips and sharing memories. In a short period of time, a great deal of information was collected about places in this often overlooked area of the Black Isle. The information was collected into a document during indoor sessions drawing on old maps and photographs, during walks to Munlochy, Kilmuir, Easter Suddie and Belmaduthy, and on visits to Highland Archives and Groam House Museum. The project was organised by Knockbain Community Council with funding from the Heritage Lottery Fund and Highland Council. Courses and fieldtrips were led by Susan Kruse of ARCH (Archaeology for Communities in the Highlands). We would also like to thank the Highland Archives, Groam House Museum and the Taylor family. But most of all, thanks to the many people who contributed information, either during the sessions or even as we were passing their houses.